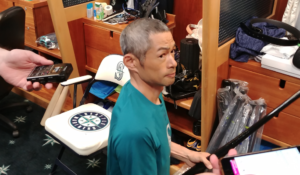 Despite his 45 years and his 2-for-31 spring, Ichiro will start this week for the Mariners in Japan, where a nation turns its lonely eyes to him again. TOKYO — Driving around Phoenix during spring training, I saw several advertising billboards with “Suzuki’’ posted dramatically (most of which represent a law firm). Interestingly, Ichiro Suzuki said he never saw those billboards. Then again, he also never had Suzuki printed on his Mariners jersey either, even though that is his last name. Instead, he has always been referred to in Seattle as Ichiro – “Ee-Chee-Ro!’’ as the fans often shout — which has been on his jersey since he started with the Mariners in 2001. 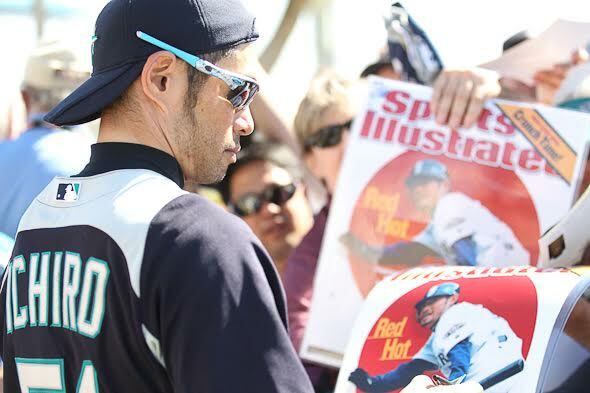 Although Seattle traded him to New York in 2012, and he played just 15 games in his return to the Mariners last year, Ichiro is back for 2019 and remains so popular that a large group of fans lined up every day for his autograph during batting practice at spring training. During the spring training games he played, he received louder cheers and applause than any other player. “I’m very grateful for that,’’ he said of the fan support. Fans at the exhibition games in the Tokyo Dome Sunday and Monday raised signs and jerseys while chanting his name in his honor. The Japanese broadcast also frequently showed him on the field and in the dugout. It also showed at least five times him making a great throw from right field to third base to keep a runner from advancing. According to the excellent author, Robert Whiting, who wrote “The Meaning of Ichiro’’ and “You Gotta Have Wa’’ about baseball in Japan, Ichiro had been the country’s No. 1 most popular sports figure for many years, even after he left the country to play here. He is so popular that there is an Ichiro museum owned by his father in Nagoya that has received many visitors. The Angels’ Shohei Ohtani, however, surpassed him as Japan’s No. 1 athlete last year. Which isn’t surprising considering that Ohtani, who both pitches and DHs, was the American League rookie of the year last season while Ichiro batted just .205 before being taken off the Mariners roster in early May. He stayed with the franchise as “assistant to the chairman,” which allowed him on the field in uniform, but never during a game. Nonetheless, Ichiro still remains hugely popular and he will be loudly cheered and celebrated when he starts for the Mariners Wednesday and Thursday in their season-opening games against Oakland (2:35 a.m. PT, ESPN, both mornings). Ichiro hasn’t had a good spring. He had two singles in 25 at-bats in Arizona for an .080 batting average. He went a combined 0-for-6 in the two exhibition wins over Yomiuri. Two weeks into the spring games, he said he didn’t even know whether he would make the team when asked about it. These will be Ichiro’s first games in Tokyo since Seattle also opened the 2012 season there against the Athletics. He also played in the 2002 MLB All-Star series in Japan. His last game while playing in Japan’s Pacific League with the Orix Blue Wave was in 2000, the year before he signed with the Mariners. The Mariners have had at least one Japanese player on their roster every season since 1998 (Mac Suzuki, no relation, also pitched in 1996). Ichiro clearly has been the overwhelming best – and favorite player. Heck, the Mariners gave out Ichiro bobbleheads even after they traded him away. He is so popular in his native country that the newest Mariner from Japan, 27-year-old pitcher Yusei Kikuchi, who signed with Seattle this winter, says Ichiro is his favorite player. After starting in Japanese pro ball at 18 in 1992, Ichiro says he was inspired to play in MLB after Hideo Nomo signed with the Dodgers in 1995. “When Nomo went over there, that’s the first time I knew about players going over there,’’ Ichiro said. Ichiro has had an amazing career here, winning Rookie of the Year and Most Valuable Players awards, making 10 All-Star teams, setting the record for most hits in a season with 262 in 2004, compiling more than 200 hits in 10 seasons, scoring more than 100 runs in eight and piling up 3,089 hits so far. And all this after leading Japan’s Pacific League in batting seven times. He is a certain Hall of Famer. Although when he will do so depends on when he retires and becomes eligible. That brings up the question of whether Ichiro will play when the Mariners return for their home opener against the Red Sox March 28. Maybe not, but you never know – spring training stats sometimes are quite different from the regular season. MLB allows Seattle and Oakland to carry 28 players in Japan, then cut to the usual 25 for the domestic season. Despite his age and steadily declining performance – he hasn’t hit .300 since 2010 and has really only had one good season in the past four — Ichiro has often said that he plans to play until age 50, longer than former Mariners pitcher Jamie Moyer lasted (he retired at 49 in 2012). Ichiro has said he doesn’t even think about playing in the 2020 Tokyo Olympics because he still wants to be in the majors then. Perhaps he can keep playing. As old as he is, Ichiro had the lowest body fat of anyone on the team – a mere seven percent (he says his body hasn’t changed much during his career). That’s even though all of his teammates are younger, including outfielder Braden Bishop, who is 20 years younger. “One of my goals when I turned pro as time went by was that one day I would play with players who were kids when I was still playing (years ago),’’ Ichiro said. “I’m now playing with guys who were in grade school when I was playing here. So many Japanese fans still love him. Which they will show in the games here. Seattle fans here will show that as well, with many wearing a Mariners jersey with Ichiro on the back. Although “Suzuki” could very well be included on his Hall of Fame plaque. Jim Caple, a longtime writer with ESPN and the Seattle Post-Intelligencer, is in Japan for the Mariners-A’s series. It’s refreshing to see how Ichiro loves playing baseball and being a Mariner after the way Earl Thomas left Seattle. Some might have issues with Ichiro being on the roster due to his age and problematic BA but this is a move for the Japanese fans where baseball has always been a popular sport and in a way an investment in marketing. According to Japantoday.com when Ichiro began playing for the Mariners in 2001, the team saw sales of merchandise skyrocket 60%. 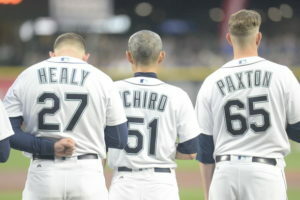 I’m sure many Mariners jerseys with Ichiro’s name will be sold during this series. It’s also fun watching the fans who are really enjoying the MLB experience. It reminds me when the Sonics did a two game series against the Clippers in Tokyo. The American professional sports leagues like the NFL, NBA and MLB talk a lot about expanding into Europe but I think they should be looking over the Pacific rather than the Atlantic. I’ve also enjoyed watching the players on social media as they get to experience a new culture, something we didn’t get to do with the Sonics in 2003. Scott Servais seems determined that this team have fun and if they do hopefully they’ll do better than the 100 losses that some were predicting after Jerry Dipoto traded away players. Merchandise sales are helpful, but it’s a small fraction of team revs. Ichiro’s role is at the request of part-owner Nintendo to celebrate him here and in Japan. All the leagues are hip to globalization. But because of travel time, the int’l audiences won’t come here, so the games must be streamed over there. The future is all about using AR and AI to deliver a game experience into homes globally that will be better than being there in person. Maybe 5 to 10 years. Maybe faster. So since I assume people will choose a “better” experience over a “worse” one, does this mean that in 5 to 10 years players will be playing in empty stadiums? And teams will still insist on a billion dollar stadium or arena paid for by taxpayers. Those days are waning, as the teams (especially in baseball) have run out of potential cities to leverage. Montreal? Been there, done that. Portland wants a team, and their “Diamond Project” (like NHL Seattle) is proposing 100% private funding. The A’s have had a dreadful experience trying to locate a new stadium for 20 years, which originally assumed (demanded?) public funding but now may not. The A’s may be better off to bide their time in the Coliseum (with the Raiders gone, and the Warriors next door) and wait for a new stadium in Portland that they may have to contribute to minimally. The next generation of stadiums (and “mall parks”) will probably be smaller in capacity and designed more as television studios than for the fan experience. An all-TV experience will be tidier than walking in a cold rain after paying $150 to park your jetpack. Wishing Ichiro success in Tokyo and a wonderful retirement. Retirement? He has yet to utter the word. Does he start in the second game? I think so. Fans would otherwise tear down the Dome. He told the team today. I was opposed to the Mariners keeping Ichiro in the dugout last year. I was opposed to allowing Ichiro to participate in spring training. I was semi-opposed to Ichiro going to Japan. But, I was happy and moved by the last two days. He is unique. After seeing the embrace this morning, I agree. Baseball is almost nothing without sloppy sentiment.